Whether you hang your garden flags in your front yard, garden, or patio your family and friends will be able to admire the beautiful seasonal flag design from EVERY ANGLE with these double sided flags. Tired of those cheap thin and flimsy nylon flags blowing everywhere in the wind? These polyester weatherproof garden flags are the BEST flag material. They are thicker, heavier, and more durable than any other garden flag material, especially cheap Nylon. Mildew, UV, and fade resistant all in one material. So when the weather changes fast, you can spend more time gathering with family and friends instead of worrying about your flags. The manufacturer offers a LIFETIME WARRANTY on every garden flag AND the garden flag pole. If your flags fade in the sun, the pole isn't heavy duty enough, or the flag artwork deteriorates you are covered by the manufacturer warranty! If You're Ready To Upgrade Your Outdoor Decor And Get The Best Quality Adorable Garden Flag Set And Pole With A LIFETIME WARRANTY, Click Add To Cart Now! DOUBLE SIDED FLAGS WITH CORRECT PRINTING ON BOTH SIDES FOR ATTRACTIVE DISPLAY AT ANY ANGLE- Unlike other garden flag sets, these flags are double sided with text that reads correctly on the back AND the front side. Double sided printing allows your guests to see the flag artwork from any vantage point. Whether you hang your garden flags in your front yard, garden, or patio your family and friends will be able to see the beautiful seasonal flag design from EVERY ANGLE. BUILT TO LAST, THICK POLYESTER MATERIAL FOR LONG LASTING FLAGS- Tired of those cheap thin and flimsy nylon flags fading in the sun fast and losing color? These polyester weatherproof garden flags are the BEST flag material. They are thicker, heavier, and more durable than any other garden flag material. Mildew, UV, and fade resistant all in one material. So when the weather changes fast, you can spend more time gathering with family and friends instead of worrying about your flags. INCLUDED STURDY METAL GARDEN FLAG STAND FOR FAST AND EASY FLAG DISPLAY - Save yourself a trip to the hardware store with this included metal garden flag pole. Unlike other garden flag poles which are fiberglass or plastic, this pole is stiff metal with secure connecting points. 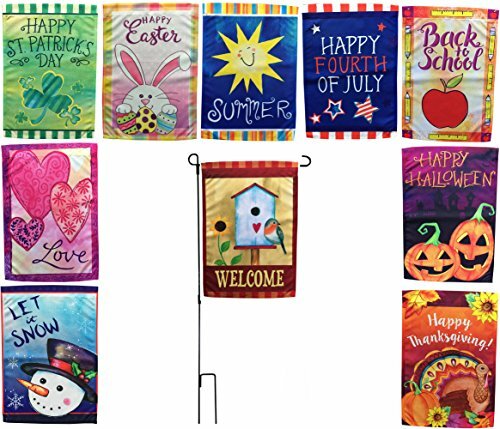 TRANSFORMS YOUR OUTDOOR DÉCOR WITH A WIDE VARIETY OF ADORABLE ARTIST DRAWN SEASONAL FLAGS- Unlike other brands that sell computer generated clip art flags, each exclusive flag in this set is specially licensed artwork by American artists. Cute seasonal holiday designs will transform your bland outdoor home décor into a festive, vibrant outdoor area. With ten different adorable artistic seasonal flag designs, it's so easy to WOW your guests every month of the year. If you have any questions about this product by Beech Lane, contact us by completing and submitting the form below. If you are looking for a specif part number, please include it with your message.